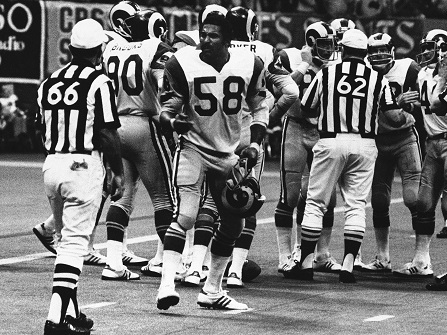 NEAR DALLAS (CBSLA) – Isiah Robertson, a star Pro Bowl linebacker for the Los Angeles Rams in the 1970s, died Thursday night in a crash on a Texas highway. Robertson, 69, was involved in three-vehicle wreck just north of the city of Mabank, which is located about 50 miles southeast of Dallas. Robertson was speeding in the rain at the time, according to the Texas Department of Public Safety. At around 10 p.m. Central time, Robertson was traveling north on State Highway 198 in a 2001 Lincoln Limousine when he took a curve at an “unsafe speed,” according to the DPS. The car skidded out of control before being struck by a 2003 Ford Ranger which was also traveling north. The impact sent Robertson’s car into oncoming traffic, where it was struck again by a 2018 Hyundai Sonata. Robertson died in the crash, according to CBS11 in Dallas. The conditions of the other two drivers, a 37-year-old man and a 21-year-old woman, were not confirmed. Robertson was the executive director of the Isaiah House in Mabank, a drug and alcohol treatment center. He was a guest speaker at the Grand Prairie High School football banquet Thursday evening, CBS11 reports. A Louisiana native, Robertson was selected with the No. 10 overall pick out of Southern University by the Rams in the 1971 NFL Draft. He was the NFL Defensive Rookie of the Year and was selected to six Pro Bowls during his eight seasons in L.A. After the 1978 season, he was traded to the Buffalo Bills, where he played for four more years before retiring. On Sunday, the Rams will be donning their vintage royal blue and sunshine yellow jerseys, which they wore when the won Super Bowl XXXIV 19-years-ago. Isaiah ‘Butch’ Robertson, a former two-time All-Pro linebacker, has died after the limousine he was driving skidded on a rain-slicked curve on a dark Texas highway. He was 69. Three children were among those killed in the storms.